Anubis is one of those that most people would recognize but may not know who he is or what he stands for. He is an ancient God who was widely worshipped in Egypt. He is the guardian of magical secrets and is the patron of embalmers, mummification and the dead on their path through the underworld. He has the body of man and the head of a jackal. It is believed that the reason he is portrayed with the head of a jackal is that jackals are scavengers who prowl along edges of desert and in cemeteries. He also has a host of messenger ‘demons’ that would carry knowledge and other things to help humanity, but these messengers could be used for good or evil. Since he is so ancient, the story of his origin has changed numerous times but the most widely believed is that Nephthys is his mother and Osiris his father. Osiris, Nephthys and Seth are siblings, with Seth and Nephthys being husband and wife as well. Seth was jealous of all of Osiris popularity and power and plotted to kill him, however Nephthys and Osiris ended up sleeping together before this could happen and when Seth found out he cursed the child- who turned out to be Anubis. When Osiris did die, Anubis was very upset and decided to wrap the dead Osiris in bandages, thus making him the first mummy. He wrapped Osiris so the air would not corrupt the body. 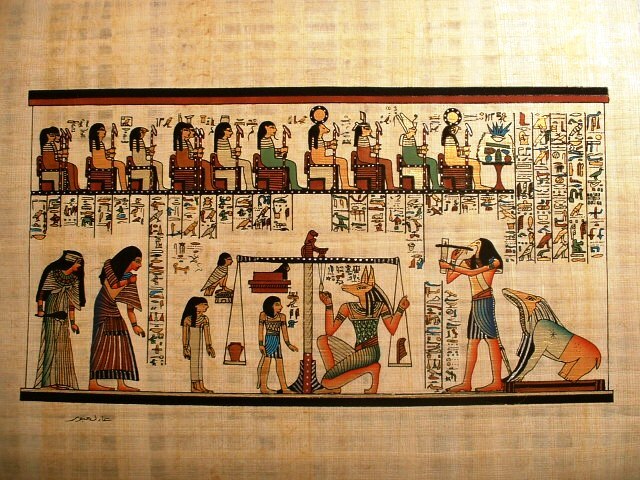 Egyptians believed that if this process was good enough for the gods, it was good enough for them. Anubis then became known as ‘the lord of the mummy wrappings’ and it was believed that if a body was not properly embalmed of mummified he would dig up the body and eat it. The cult centers for Anubis were Cynopolis ‘ city of the dog’ and Heliopolis ‘city of the sun’. Both places are long gone but there is still the Temple of Re-Atum obelisk from Heliopolis. The symbols for him are embalming equipment, a hide hanging from a pole and of course, the jackal. By worshipping Anubis, people hoped to invoke him to protect their deceased from natural decay. Also, when mummification was popular, priests who supervised the preparation of the mummy would wear a jackal-headed Anubis mask. Anubis may not be as popular as he used to be, but he should still be well respected and honoured.